You have probably seen the chart here. 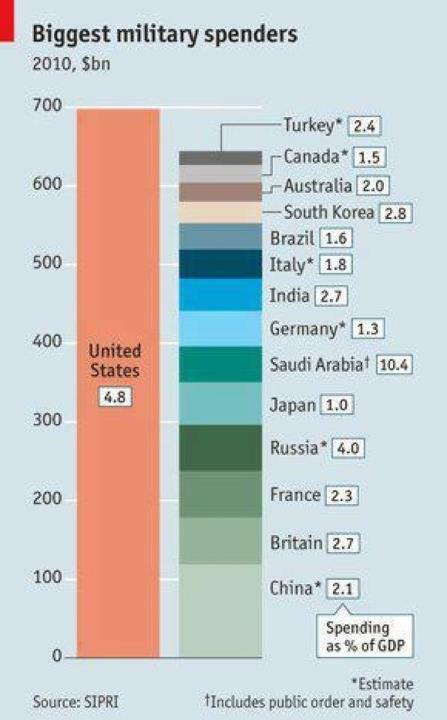 It is making the rounds on Facebook, and it is alarming — not because our country now spends seven hundred billion dollars on the military, but because of the sharp contrast between this country and the rest of the world (including China!). Our priorities are clearly skewed. In an election year when we might do well to do some deep thinking bout our priorities and about the huge debt we are passing along to our grandchildren it might be wise to consider this chart. We all believe the economy is “the problem,” or most of us seem to do so. It’s not. It’s the fact that we are throwing money into the black hole of the military (in the name of “defense”) while the nation goes deeper into debt. Meanwhile we refuse to pay more taxes while we cut and slash needed social programs, our infrastructure falls to pieces, and our health care system falls behind the rest of the developed world. Though the military has had the lion’s share of the budget for years, the “war on terror” has given them virtual carte blanche. It is worrisome. It’s one thing for the money to go toward building “drones” that are sent into dark places and kill indiscriminately. That is a moral horror story. But perhaps we can rationalize it, together with our world-wide military presence, on the grounds that these things are keeping us safe from terrorists. Perhaps. But, as we all know, the amount of waste in this part of the budget alone is almost certainly enough to bail Greece out of its present economic woes — though you never hear those calling for tax cuts suggesting that the military budget be cut. No sir! These are anecdotes, of course, and anecdotes don’t prove anything. But they sometimes do tell a story: they reflect a mind-set, and in this case reveal the sorts of waste of taxpayers’ money that are typical — not only in the state’s revenue in the case of our two pathetic tennis courts, but the nation’s tax revenue in the case of the waste on frivolous, needless luxuries in the name of “defense.” I daresay we could multiply these examples a thousand-fold and it would give us a headache — especially when our kids aren’t getting an adequate education and the poor and the sick in this country are about to be abandoned, while the military grows fat. We really do need to reshuffle the deck. Someone isn’t playing fair! Whenever the N.R.D.C. magazine, onearth, arrives I shudder and tend to put it out of sight or recycle it immediately. When I do read it, there seems to be nothing but articles about the latest atrocity that humans have committed against the planet — news about the effects of global warming or climate change. It’s depressing to read that by 2050 “climate change could result in the loss of about two-thirds of arable land in Africa.” And this in the face of the disturbing fact that in 40 years the African urban population will have tripled. Who needs that? But, then, if one is willing to grit one’s teeth and read on, there is also some good news, such as the news that a British economist has stepped forward and suggested that we abandon the outdated notion of continued economic growth for a new paradigm: sustainable growth. The idea has been around for some time, but there is a prejudice against the notion based on the false assumption that sustainability is a plot to undermine capitalism. It is assuredly the case that you won’t hear any of our politicians running for office in the next couple of years preaching the doctrine of sustainability. We continue to believe that a growth economy is a viable idea. But sustainability is a notion whose time has come, and the article in onearth gives one hope that others will step up and bite the bullet. There is also news about various devices that have been invented to help provide energy from renewable sources, or modifications that can be made on our automobiles that will convert them from gas to electric — with suggestions about how solar panels can be used to provide the electricity for the cars. For example, Ben Nelson from Wisconsin, one of the new breed of “eco-modders,” has modified his Geo Metro so it now requires no gasoline. It is encouraging to know that there are people like Ben around who are serious about getting us away from our dependence on oil, though they be few and far between. Despite its glacial pace, there is in fact an environmental movement. Politicians and large corporations refuse to back the movement — insisting (wrongly) that support of the movement will cost America jobs. This is what logicians call a “false dichotomy”: either we continue on our present path or we lose jobs. In fact, promoting renewable sources of energy would create thousands of jobs. But it sounds like heresy to a great many voters, so the politicians (and the corporations that back them) for the most part, keep clear of the “tree-huggers and insist that we open up the Alaskan wilderness to further oil exploration, or expand off-shore drilling — while we make a concerted effort to trash the E.P.A., that watchdog agency that has the unmitigated gall to put constraints on Big Business. We have the unfortunate urge in this country to make heroes of our athletes and movie stars. In fact, people like Ben Nelson are the real heroes, people who are making an attempt to change our way of doing business and helping up find ways to treat our earth with more respect. The cynic in me worries that it is too little too late, but one has to start somewhere, and it is good news to read that there are those who have already taken steps. Further, it does appear that the younger generation has shown signs of a greater sense of responsibility toward their planet, and that is also good news. The trick is to hang in there until the movement gains momentum. And that means holding off the large corporations until the new generation of idealistic young people gains a foothold — or the situation becomes so grim that even the doubters are forced to pull their collective heads out of the sand (or wherever else they have them buried) and admit that the earth deserves the respect of everyone who lives on it. We do live in a commodified culture, as Robert Heilbroner told us many years ago, but our values are clearly out of kilter when money and the things that money can buy become the main focus of an entire nation. If we take a commodified culture preoccupied with owning things, combine it with an immense advertising machine that works buyers into a frenzy prior to Thanksgiving, it is no wonder that things like this happen. We shouldn’t be surprised; clearly things are out of focus. Citizens who bother to go to the voting booth any more are there to turn around a weak economy. That has been the rule for some time now: vote out the bastards who are taking money out of my pocket. The real issues, like the damage we are doing to the environment in our tizzy to raise our already obscenely high standard of living, are largely ignored. Christmas should, of course, be a time for reflection and thought about others. In this country, and other “developed” countries around the world, it has become a time to get that 20% of the yearly profits that keep the engines of commerce running. It is understandable, since business has become the cornerstone of our culture. But is it necessary to point out that the ideals of business are antithetical to the ideals of the one whose birth we celebrate next month? The fact that a woman in California would pepper-spray her way to the cheap electronics in Walmart is simply a sign of the times and a clear indication that we need to rethink our priorities.